There are now more than 30,000 people in Virginia prisons, costing taxpayers more than a billion dollars a year. A growing number are senior citizens with average healthcare costs of $68,000 a year. The parole board could release many of them, but it’s been freeing less than five percent per year. Hundreds of elderly prisoners are passed by for geriatric parole. Nearly fifty years ago, Minor Smith – known to his friends as Smitty – was locked up for murder. At the time of the crime he was broke and unemployed, so he decided to rob a small grocery store in Charlottesville. He hoped no one would recognize him, but when he approached the clerk, things went wrong. He died, and Smith was sentenced to life in prison. Now 71 and legally blind, he looks back on his time in six different prisons and recalls years of abuse. Today, Smith is a resident of the honors dormitory at Buckingham Correctional Center, where reporters are not allowed to record. He spends his time working in the cafeteria, earning 45 cents an hour, and writing poems about his life before prison. From memory, he recites one recalling the night he stuck out his thumb, hoping to visit the woman who would become his wife. Minor Smith is statistically unlikely to commit new crimes, and he’s eligible for parole, but after so many years in prison there are no relatives to take him in. If he got out he thinks he could find work translating books into braile. But, for now, the question is moot. While it’s supposed to release elderly people who are no longer a threat to the public, the parole board considered all prisoners over the age of sixty who had served at least ten years and those over 65 who’d spent at least five years behind bars. There were 540 of them, and the board released just 39 – often explaining that the crimes they committed were serious and insisting they needed to spend more time in prison. Inmate Stephen Colosi understands that kind of thinking but says vengeance is not a good basis for prison policy. And the head of the parole board says younger criminals who are more likely to commit new crimes can’t get into state programs designed to rehabilitate them. 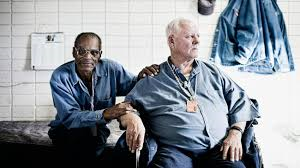 With Virginia prisons now – in her words – stuffed with old men taking up bed space,” the younger criminals do their time in local jails that have few programs for prisoners.